It has 138 horsepower, a six-speed automatic, airbags everywhere, a big touchscreen with Siri and Wi-Fi for all seven of your smartphones. This is the 2015 Chevrolet Trax, the workin' man's version of the Buick Encore, in a nutshell. Chevrolet has sold 90,000 Trax in 60 countries since its launch in the late fall of 2012, and after withdrawing from Europe, it's easy to see why the Trax needed new markets while the Opel Mokka (known as the Buick Encore in America) keeps fighting in the old continent. Chevy thinks the demand for small-SUV could grow by 2 million units in the next few years. Just like the car you can get right now in Canada, the U.S. version will have the 1.4 turbo engine rated at 138 horsepower and 148 lb-ft of torque, linked to a six-speed automatic. 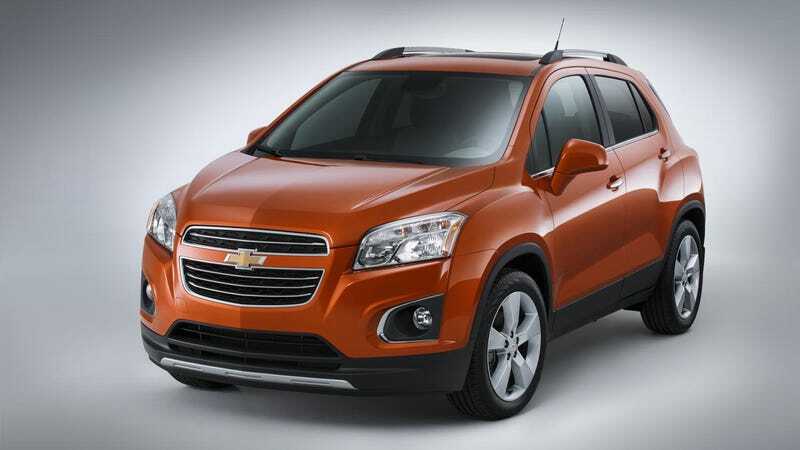 All-wheel drive and park assist are optional, but the Trax comes with 10 airbags and a rearview camera as standard. Inside, there's a seven-inch color touchscreen as part of the MyLink infotainment system, which will feature a 4G LTE connection from OnStar enabling up to seven portable devices to share a Wi-Fi hotspot. Siri and BringGo navigation completes the gadget package. Also, 43.1 cubic feet of cargo space! If Chevy is right, this is what American buyers want instead of compact and mid-size sedans. Or wagons.